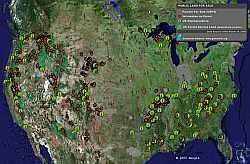 The Sierra Club has created a Google Earth file providing information about a proposed plan by the US government to sell 800,000 acres of its own public lands to fund a program. While the program may be important (funding for schools), I don't think I'm the only US citizen who thinks selling our public lands is the way to fund government programs. Especially when you view the number of parcels and exact locations of the proposed lands in the satellite and aerial photos of Google Earth. Most of the proposed parcels of land fall within National Forests and are pristine areas with primeval forests with mountainous terrain and untold amounts of wildlife and other plants and organisms important to our environment. 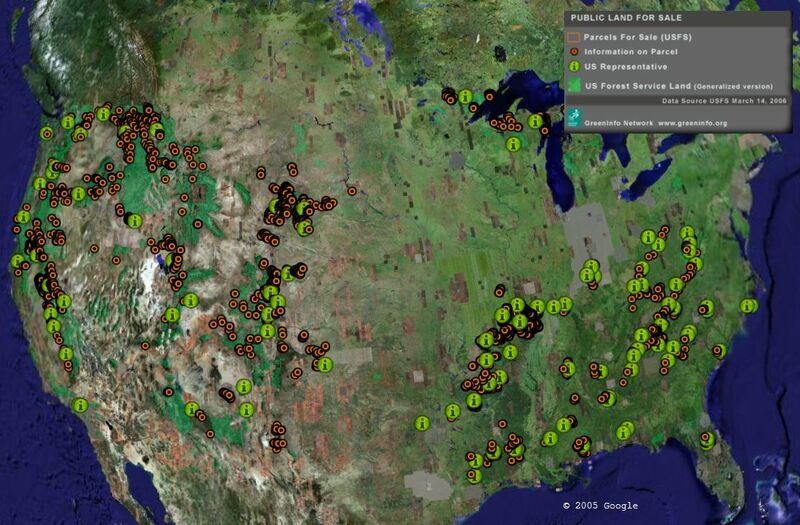 See for yourself, load this Sierra Club GE file and you can easily see the extent and type of land we would be giving up. There's no better way to see what this land sale proposal consists of other than driving out to see the lands yourself. The public comment period on the proposal is open through March 30. If you are like me, a US citizen and against this proposal, then take action now. There are more details on the proposed sale at the Sierra Club here. This also includes a place to sign a petition. The file shows the congressional representatives and the number of acres proposed in their districts. You should also contact your congressional representative about your lands. i think that greeninfo did a pretty good job with this. it seems like it is still hard to add a folder with hundreds of points and not have the 'places' folder get really hard to navigate. anyone know of a way to hide the contents of a folder so you don't have to look at all of that data? it was a similar problem on the ANWR .kmz , where if you showed the oil wells, you got a gigantic list of every well in the state. i added up the acreages on the parcels in question and it came out to 303,288 acres, not 800,000. not sure if this is an error in the way that the GIS added acreages, or if this is the true number. Well observed and I'm impressed with the calculation. you are correct, the Forest Service has currently proposed 303,000 acres of Forest land that is being proposed for sale. The 800,000 is a figure that has been mentioned as all Public land that may be for sale from all Public agencies. This KMZ is addressing only the USFS Forest Land. Paris Hilton needs her tax cuts. What's pristine wildreness next to that? You know what is bizarre? The government will still be buying land, but by selling off some over the next five years it will slightly slow the intake.